Hayabusa once again develops a new set of high-quality MMA gear and have released their 16oz. Pro Sparring Gloves, perhaps one of the best sparring gloves available today. These gloves feature 100% Premium leather that is easy to work-in and have the right blend of elasticity and protection for a very durable outer layer. It has a specially made foam complex construction that is suitable for all types of MMA training. As with other Hayabusa MMA gear, the gloves have a very solid and tight stitching that will endure the high stress from heavy training. The gloves as you would expect are just built to be very durable. The most significant feature on the gloves is the new Dual cross closure system. This glove has two straps that come from each side to wrap over each other. Instead of the traditional strap that wraps around from one direction. These gloves are be secured from both sides of the wrists, providing the maximum wrist support and stability in a sparring glove. It has enough support to wear without handwraps, but for safety precautions, handwraps are always recommended. To further add to a great fit, the glove is ergonomically designed to conform to your hands. 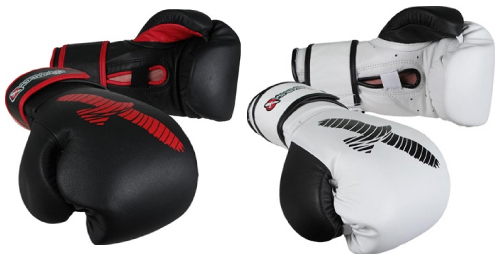 These are the best sparring gloves available right now. They are made of high-quality materials and put together very solid. The Dual cross closure is the best strap in sparring gloves and provides the most secure fit. Definitely a good purchase since the gloves are amazingly only priced at $89.99.